In the Referring facility field select the facility to be visited by the technologist. Administrators can modify the facility list by going to SETUP → REFERRING → REFERRING FACILITIES. In the Study groups field select what groups of studies the technologist will be able to perform. Administrators can modify the study group list by going to SETUP → TESTS → STUDY GROUPS, as well as the list of available studies by going to SETUP → TESTS → STUDIES. 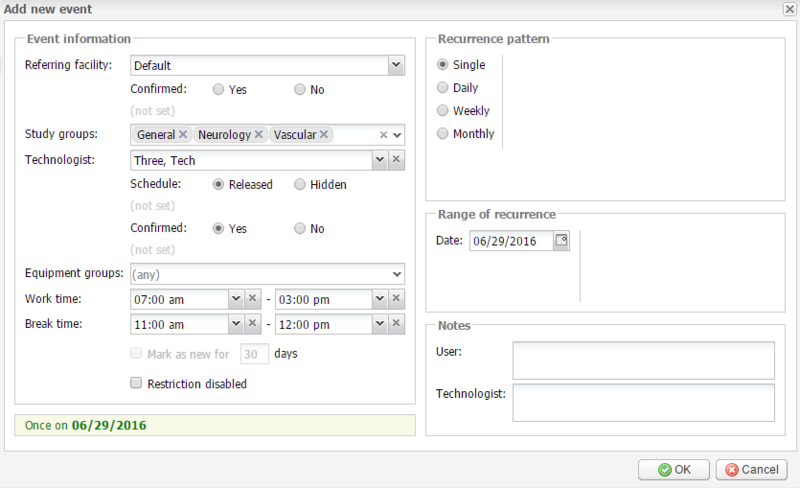 The Work time and Break time drop-down lists allow you to specify the work and break hours of the technologist. Another way to add a new event is from the Schedule Rules module by clicking the Add new button. 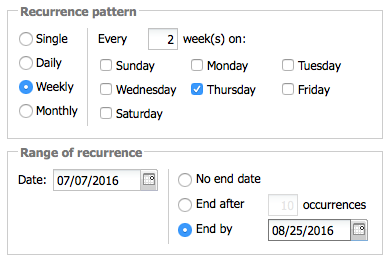 In the Schedule Rules module you can add only a recurring event while in the Schedule module you can also add a single event. For more information please refer to the Schedule Rules module.